Osaka is known as the kitchen of Japan, and the friendliest city we visited. Although it’s the third largest city in Japan, it’s comparatively less veg*n-friendly than Tokyo or Kyoto. Good thing is, Osaka is much more budget friendly, which is why we did all our shopping there before coming back to Singapore. In certain eateries, you can taste vegan versions of famous Osaka street food like yakiniku (BBQ meat skewers), okonomiyaki (savoury pancake), teriyaki (grilled meat) and takoyaki (octopus dumplings)! While offering all the modern comforts of a big city, Osaka is also laid-back and friendly – so I never felt overwhelmed here like in Tokyo. Some shops and even large department stores open late and close rather early. When in Japan, don’t forget to look down! Veg*n is a shortened, inclusive term to refer to vegans and vegetarians. This article is solely based on my experiences and research, thus may not represent the whole of Osaka. The biggest train station in Osaka, connected to many malls and department stores. 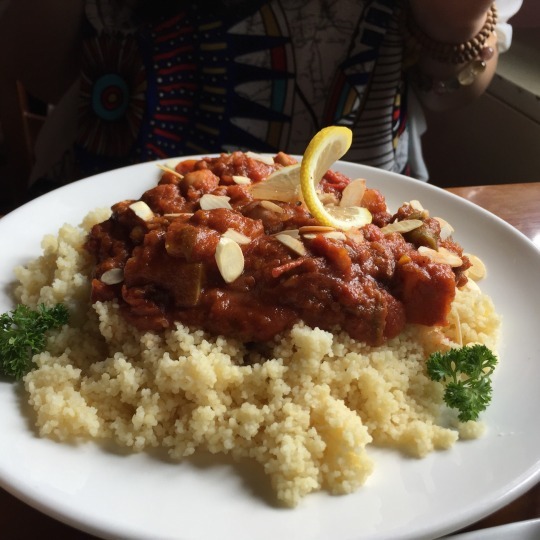 There aren’t any pure veggie or vegan places here, but there’s a few places that offer vegan dishes. Most places near Osaka station seem to open at 10.30am or so, so we didn’t walk around looking for breakfast. After my trip someone from the Osaka Vegans group suggested a few breakfast places with vegan options around this area, which we’ve added to our map. Generally, you can look for bakeries as those are open early. All bakeries I visited in Japan have breads without egg and dairy (labelled clearly) and most can do an americano. Some may even offer soymilk for coffee. Alternatively, you can grab cheap bites like certain onigiris, edamame, certain cookies, sesame buns, soymilks and more from konbinis – list here. On the 6th floor’s restaurant area in Yodobashi Camera building, which is linked to Osaka Station via an elevated walkway. All Chabuton outlets in Japan has vegan ramen and gyoza. You have to buy a ticket from the vending machine and pass it to the server. A cheap and quick place to settle a meal. Review. Ramen in Japan is always too salty, I really prefer our noodle dishes! 10 minutes walk from Osaka station and has 4 veg*n spots (WaGwann, Aju, Babel Cafe and Pineapple Cafe) within a kilometer. Thus we booked this hotel (didn’t book Airbnb, we wanted luggage storage and airport shuttle for our last day). 10 minutes walk from this hotel is the fancy Hotel New Hankyu, which has the airport shuttle and is right next to Osaka Station. The hotel said there’s nothing vegan in the breakfast buffet, which was okay because it was a bit expensive anyway. We can’t really cook in the room, which is why I carried a light and small electric travel cooker for such situations. We got bread, natto (those without fish sauce), oatmeal (I heated up with water in the cooker), wakame and sushi from supermarkets and had a cheap, substantial and balanced breakfast. If you don’t wish to make breakfast, you can check out bakeries near Osaka station or grab a bite from konbinis. Alliums & Alcohol: Some dishes have, labelled clearly. Sells alcohol. Has vegan okonomiyaki and yakitori! Impressively large menu of hearty, wholesome foods at an affordable price (by Japan standards). There’s only one person manning the cafe so be prepared to wait if it’s full house. Review. Okonomiyaki is a savoury pancake consisting of cabbage and a type of meat. Usually topped with a tangy sauce, mayo, dried seaweed, bonito (fish) flakes and spring onions. By default, the batter will have egg. Which is why I only ate this in places that serve the vegan version. Located in a shopping arcade 8 minutes away from the station. Passed by this place but didn’t find a chance to visit as they aren’t open for dinner on that day. 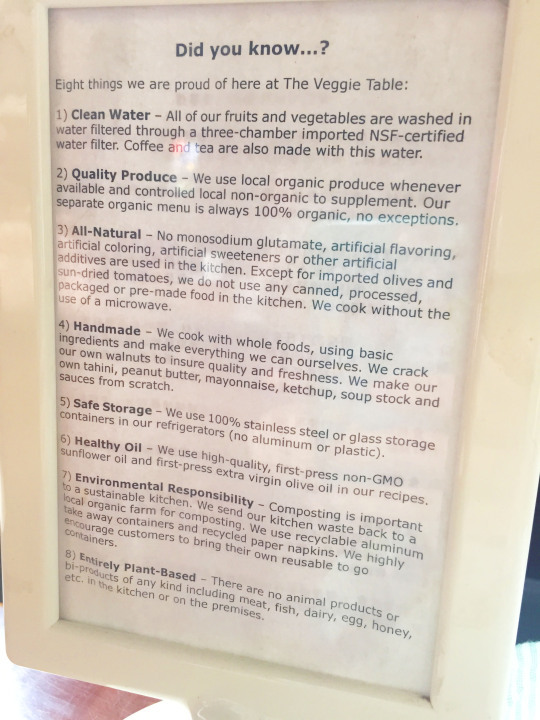 Seems like a healthy vegan cafe with many raw foods. Looks so fun and welcoming! Another popular shopping district, this one is like our Orchard Road so I didn’t explore much of it. Only went to a drugstore and bought 15 of this amazing chocolate rice crispy back! About 6 minutes walk away from the Shinsaibashi (exit 2) station. However, the station is huge (10 blocks long!) and which exit you’ll end up at also depends on where you’re coming from. So if you want a simpler route, exit at smaller stations like Hommachi (Restaurant Green Earth is near this station) and Nishi-Ohashi. Had the best mock meats here, so I’m sure omnivore friends will enjoy too. The teriyaki tempeh is something I won’t forget! Review. Grilled vegan eel rice bowl (donburi). Compared to Bespoke’s version, this is more shiok! Shopping district where the famous Glico running man is at. Come here to be amused by the crazy eye-catching displays made by restaurants and get some omiyage (souvenir) shopping done! A hungry, ramen-holding dragon isn’t something you see everyday! Dontonburi is mainly a takoyaki and okonomiyaki food street and “normal” Osaka street food isn’t vegan. Surprisingly, Dontonburi has lots of Chinese restaurants! We discovered one shop towards the end with a “we have vegetarian food” sign at the door! The staff even checked with us if onion/garlic is okay. You may think that Chinese food is everywhere in Singapore, but Chinese food is so diverse. 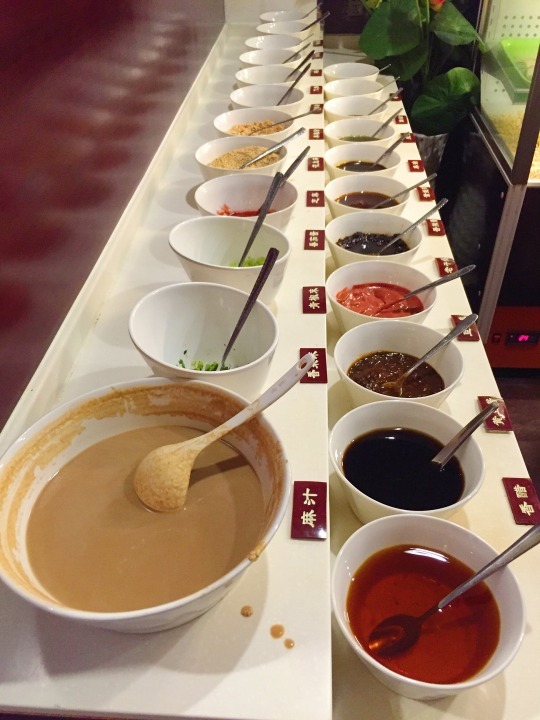 This place focus on dishes from Shaanxi, Shanxi and Xi’an, and specialises in dao xiao mian (knife shaved noodles). 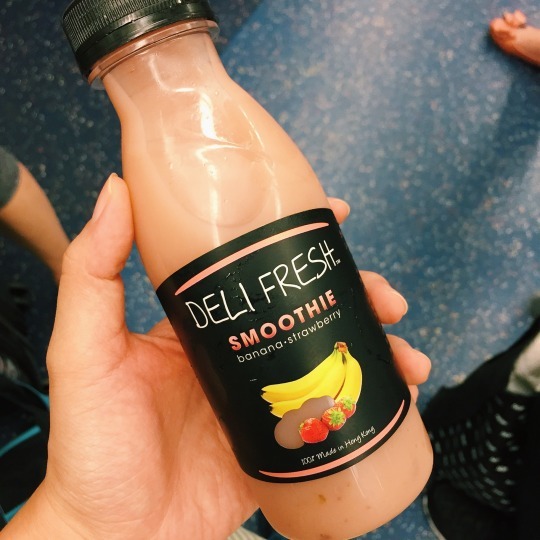 I’ve not found vegan versions of those in Singapore yet! Definitely worth a try. Review. Says in Chinese, “We have vegetarian food, can do takeaway.” A Chinese restaurant with photos that look like these, is very likely to have authentic food! This may be the station where you get off for Dotonburi, depending on where you’re coming from. Like all other big stations in Japan, it’s huge and has multiple levels, track lines and exits. So always ask the station staff for directions, I learnt that it’s futile to figure things out by yourself! On the first floor of Maruito Namba building. A huge supermarket in Namba station with a bakery and prepared foods section. Carries vegan mayo, soymilk bread, natto and cucumber sushi and many more. 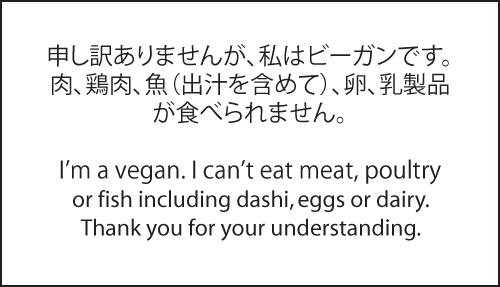 If you’re unsure about what’s veg*n in the prepared foods section, you can check with the kitchen staff – but be specific when asking since not everyone in Japan knows what vegan is. We did our omiyage shopping here instead of buying in tourists areas. Supermarkets sell pretty much the same thing, with simpler packaging and it’s cheaper! Review. Japanese mayo is tastier than Western mayo, in my opinion! Located in airport’s Hotel Nikko. Has one traditional Kyoto-style vegetarian set indicated on their website. Not sure if it’s vegan though, as tempura batter usually has egg. Seems expensive, so we didn’t eat here. Before we went to Kansai Airport, I reserved 4 bentos from Tsutsu, a local vegan home chef, by messaging her Facebook page. She met us at Nakazakicho station since it was quite near her house. She even gave us a handwritten menu – so kind and thoughtful! Thanks to this homely, balanced bento, we had a lovely and affordable lunch in Kansai airport! She’ll start her own cafe soon, so follow her Facebook to get updates. Review. This convenience store is in the departure hall, behind the Starbucks where you can get soymilk with your drink. I bought some daifuku (big mochi), natto roll and seaweed onigiri to snack on the plane. Here’s a list of vegan konbini food items. Has vegan takoyaki – likely the only place in Osaka that does! Next to Shin-Imamiya Station, which is outside the city area of Osaka so be prepared to travel a bit. I didn’t visit as it’s a smoking bar, which my family won’t be comfortable in. From reviews in the Osaka group, the takoyaki is really yummy and you can even make it yourself! I heard good things about their okonomiyaki and food in general. Sadly, they were closed during our stay in August (luckily I checked their Facebook before visiting), as it was the Obon holidays (which is something like our Qing Ming). Seems like a highly recommended place if you want to taste vegan versions of local food! Kyoto’s many atmospheric shrines and grand temples offer visitors a glimpse into Japan’s ancient past. Come here to experience “wabi-sabi”, the Japanese aesthetic of finding beauty in imperfection (not wasabi!). Everything seems beautiful, from the moss that covers a rock in temple gardens to the irregularities in the ceramic cup that matcha is served in. Kyoto has a much slower pace of life than Tokyo, which also means that many small businesses close earlier or have irregular opening hours. Don’t expect to find Buddhist vegetarian food at the temples. In fact, meat and alcohol are sold in many temples – a huge culture shock for me! This article is solely based on my experiences and research, thus may not represent the whole of Kyoto. Kyoto Tower – visit near sunset! There seems to be not much options in Kyoto station except this Korean place (which I wasn’t interested in as Singapore has good Korean food). Kyoto Tower is connected to Kyoto Station. There’s one vegan place in the basement food court. A small vegan stall in the food court below Kyoto Tower, more like a bar. Main focus seems to be the alcohol they sell. Not much choice of main dishes, but overall quite tasty. Review. Why I love Japan – detailed allergen information! Hidden in an alleyway, but 5 minutes walk from Kyoto Station. It’s located in a wooden house in a residential area. Lovely homemade food. Some dishes are written at the counter, some are inside the menu so look closely. Also has a small grocery section where you can get miso instant noodles and macrobiotic cookies. Review. Keep your eyes peeled for this door! Modernized traditional ryokan (Japanese-style inn) about 8 minutes away from Kyoto Station. We stayed here a night just for the experience. Highly recommended as the tatami rooms were the most comfortable and spacious rooms we stayed in. They understand vegan and provided the most amazing Japanese breakfast. Breakfast is included when you book through Booking.com – remember to type your request for veg*n one and confirm again when checking in. Review. Looks simple but fresh and exquisite! Favourites were the grated yam soup, tofu and soy milk. A transit spot with another station (Shijo Omiya, goes to Arashiyama) and many bus stops nearby. In Japan, it’s quite common to see different stations in the same area run by different companies). So you’re very likely to pass by here. 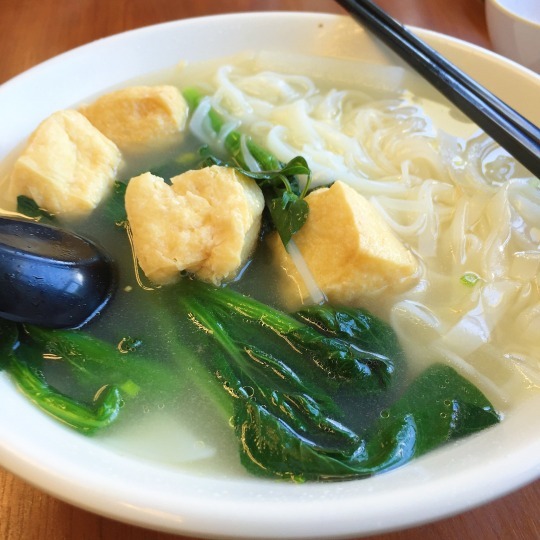 Taiwanese vegan food – the best-tasting, most value for money and substantial meal we had in Kyoto, served by an old couple who are devoted Buddhists – thus no alliums and alcohol in the restaurant. They were the friendliest and sweetest owners we met. Not easy to find as signage is not clear. Located on the second floor of the building 2 blocks behind 7-11. Review. Highly recommended for big eaters! A bustling market offering local goods, street food, tax-free shopping and souvenirs. Lots of food options here! Lots of street food even for vegans! Rice crackers (check for fish sauce), fried tofu (check for meat and fish), pickles, ice cream, traditional sweets and more. We sampled incredible pickled mountain peppers, handmade soymilk, soy sauce dango and black bean ice cream. Review. Black bean & sesame ice cream! Alcohol: None tasted. Some dishes use alcohol. Shop sells alcohol. Their menu is very Western so wasn’t interesting to me as a tourist from Singapore, but come here for the soy karaage and those vegan desserts (like their famous matcha pancakes) that aren’t available in Singapore. Review. Vegan version of Japanese deep fried meat, made with soy protein (TVP). Sells quick and light meals of Japanese-style soups, onigiris and drinks. Labels the soups with fish stock clearly; most of the menu is vegan. Only has 3 seats. Review. Not sure what are the 3 white cubes though! Popular cafe famous for their vegan desserts. There’s a queue system to manage the crowd. We waited for an hour on a Tuesday afternoon, so I got a light lunch at Miso Pota first. Fish stock is clearly labelled here. Request the English menu from the start if you look Japanese – otherwise they will give you Jap menu. Desserts were truly fantastic, but be prepared to wait. Review. The most perfect vegan dessert I’ve had! That’s a layer of coffee jelly below. A picturesque path along a canal that leads to Kyoto’s most famous Zen temple. Grab some fresh matcha along the shopping street leading to the temple. Big eaters, rejoice! Japan’s food portions are usually small, but here they can upsize for you – for free! Not exactly local food but offers some interesting and tasty Japanese fusion dishes at a great price. Also had the best vegan pudding here. Review. Wakame pasta! Wakame is a type of very tender Japanese seaweed. A small shop located along the left side of the food street near the entrance of Ginkakuji Temple. 3 onigiris labelled vegan. I didn’t try but it looked good – handmade and grilled in an open kitchen! There’s a few onigiri shops along the street, this was the only one with vegan labels. Kyoto’s most famous mountain sightseeing spot with a sprawling, towering bamboo grove. Alcohol: Grilled eggplant’s miso topping had slight alcoholic taste. Sells alcohol. Known for authentic shojin ryori (Japanese Buddhist cuisine). Authentic means it’s fully vegan and cooked without alliums and alcohol (although certain ingredients used may contain a bit of naturally occurring alcohol). There’s other places that serves shojin ryori but with small amounts of egg and dairy, so don’t assume all shojin ryori dishes are vegan. Offers 3 sets, 2 of them requires reservation through their website. Review. Shojin ryori is like fine dining! A residential area about 30 minutes from Kyoto Station. Walking distance from 3 veg*n spots: Apalila Bakery, Falafel Garden, Riverside Cafe plus my favourite Takoyaki cooking class! A cafe and bakery that sells breads made from natural yeast. Every single piece we had here were hearty with just the right bite. Now I wish I booked our Airbnb near here so I could wake up to lovely breads every morning. Review. So good that I get emotional thinking about it now.. Learn to make vegan and gluten-free takoyaki (octopus dumplings) in Kyoto with Sayuri from Vegan X Gluten-free Lab! Fully hands-on and you can make and eat as many as you like. Recipe is pretty straightforward and Sayuri is very kind and patient so you can’t go wrong! The perfect activity for anyone who loves learning about food. Drop Sayuri a message over instagram to arrange! Review. Go off the beaten tourist paths and learn to make local food with a pro! Here’s continuing from the previous list! Here are places quite near or further away from Tokyo’s train stations, and are near the following sightseeing spots. Reference map here. This article is solely based on my experiences and research, thus may not represent the whole of Tokyo. It’s not the usual museum where you simply peer into glass cases. The exhibits were thoughtfully designed and brought the atmosphere of ancient Tokyo to life. You can also engage an English volunteer guide for free. Designed by a famous architect from 1960’s Metabolism movement. Geeky designer moment for me. A cafe about 5 minutes walk away from Ryogoku Station and 8 minutes to the museum. Located at level 2. Servers could not speak English and had no English menu. Good thing they knew the word vegetarian and confirmed when I asked if something was vegetarian. Has a health grocery shop below with vegan mayo and other packaged foods like instant ramen and sauces. Review. Brown rice instant ramen, available in 3 flavours (not gluten-free though). We stayed in this women-only capsule hotel 6 minutes from Kanda Station for a night. I won’t recommend staying more than one night. An interesting futuristic experience – capsules were comfortable but offered little soundproofing. Alcohol: None tasted, shop sells alcohol. Vegan cheesecake has sake lees. About 8 minutes away from Kanda Station, this vegetable themed izakaya (Japanese bar) can do a vegan okonomiyaki (savoury pancake) and tofu cheesecake. Okonomiyaki is customisable so feel free to make requests. Only has about 6 seats. A little hard to find as it’s in a residential area. The friendly and eccentric owner can speak very good English. Review. A non-traditional okonomiyaki! Topped with fried mushrooms instead of dried fish flakes. Tokyo’s oldest and most famous ancient Buddhist temple with impressive gates. At the tourist information centre opposite the Kaminari gate (first gate with 雷门 lantern) , you can get a printed copy of Tokyo Vege Map. The kind of place where all your photos will be ruined by tourists :/ . There are many small shops leading to the temple. 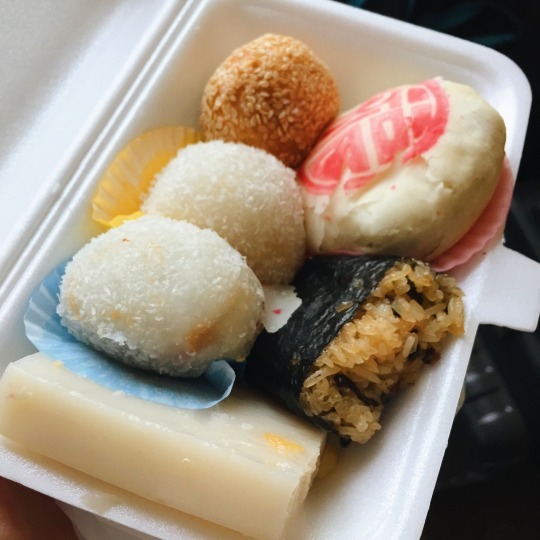 Some sell traditional Japanese sweets or snacks that are vegan, like rice crackers (check for fish sauce), yokan (agar based sweet), various mochi and crushed ice (in summer). Note that anything cake or pancake-like in Japan very likely contains eggs and dairy. 4 minutes walk from Senso-ji. Sekai means world and this cafe aims to cater to people from around the world. They offer options for vegans, allium-free vegetarians, Muslims and gluten-free people. The whole cafe is halal; they also have a branch near Tokyo Sky Tree. The food quality is incredible, but menu is limited and doesn’t offer local food. Provides a printed Muslim-friendly restaurants map. Review. Alliums: One ramen has, the other doesn’t. Check when ordering. In the shopping arcade near the temple. Offers 2 vegetarian ramens at an affordable price. I didn’t eat there, only passed by and saw this banner. A cheaper option near Senso-ji. A hipster neighbourhood known for vintage clothes shops and quirky knick-knacks – somewhat like our Haji Lane. Not as crowded as other popular neighbourhoods, perfect for a chill afternoon in a cafe. A small smoothie and juice bar where I had the best almond milk ever! Review. Organic health grocery shop next to Shimokitazawa station. Spotted vegan breads, cookies and butter. Finding vegan breads in Japan is even harder than in Singapore. 99% of supermarket and konbini breads have egg & dairy. Here, the only allergen listed is wheat (小麦). Popular shopping district for international brands, like our Orchard Road. I enjoyed the food here more than the shopping. Indian food was the last thing I expected to eat in Japan as Singapore offers excellent Indian cuisine. We ended up here to take shelter from a sudden typhoon. It turned out to be a great experience – eggs and dairy were labelled clearly and the buffet offered fantastic value for the quality! Even had delicious vegan kheer! Review. Highly recommended by one of my Airbnb hosts. Gonpachi is known as the Kill Bill restaurant because the movie “Kill Bill” was inspired by the restaurant in Nishi-Azabu. They have a branch in Shibuya, Ginza with a vegetarian menu (seems to require reservation). My host recommended me the vegan sushi, but I couldn’t find a chance to visit. Try it and let me know! Although I didn’t enjoy Tokyo itself that much as it was more overwhelming than Singapore, the day trips offered a much needed respite from the crowds and heat wave. 40 minutes by train from Shibuya station. A coastal town that was once an ancient capital of Japan, thus the many temples. 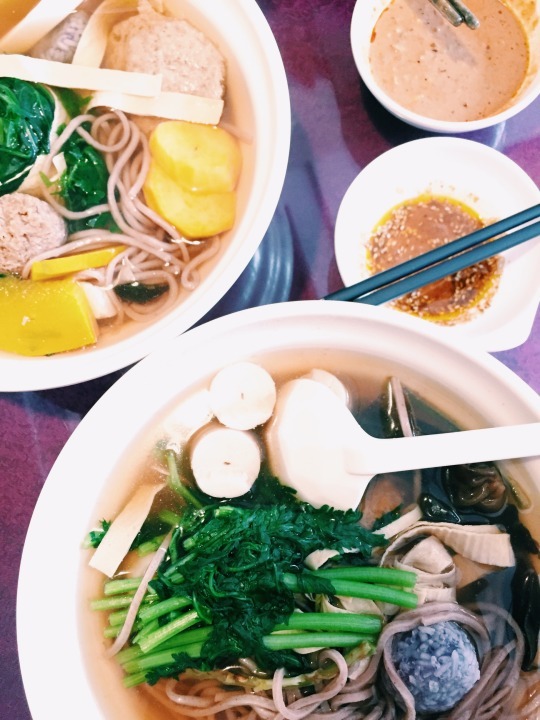 Despite being famous for its Buddhist temples, Buddhist vegetarian food is uncommon here. This is a traditional lacquerware museum’s restaurant, 5 minutes walk away from Kamakura Station. Offers 2 vegan options – a vegan set and udon. Had the best traditional Japanese set meal of my trip here. Review. I’d travel to Kamakura just to eat this again. This peaceful temple is about 5 minutes from Kita-Kamakura Station (that’s a different station from Kamakura station). The teahouse requires some effort to find. You need to follow the sign that points to the bell, pass by a car park and climb 140 steps up a hill. You’ll be rewarded with exquisite Japanese sweets and a beautiful mountain view. Review. Dango with roasted malt tea and amazake. Yokohama is a port city about 20 minutes by train from Shibuya station. It was one of the first cities that opened up for trade, thus have plenty of American and European influences. Red Brick Warehouse. A repurposed historic building on a pier. Alcohol: Not used in the ramen. All shops sell alcohol. If you love learning about food and history, this place alone is worth a trip to Yokohama. Showcases ramen’s history and types, plus an area accurately replicating the streets of 60’s Tokyo. The traditional food court offers ramen from various regions of Japan. Vegan, Muslim and alliums information are on their website. Museum shop also sells packet instant vegan ramen. Review. Never expected vegan tonkotsu (pork bone soup) ramen to exist! Located in the Marine & Walk building a bit further away from the Red Brick Warehouses. Had a vegan apple pie and apparently serves another savoury vegan one at dinner. American themed but communication was an issue. Seems like none of the servers could speak English and service wasn’t good by Japanese standards. Review. Lovely pie – perfect portion for an afternoon snack. Tokyo, being the world’s largest city, is often the backdrop of various literature. My favourite manga, Akira, was set here. Tokyo excites the senses – sometimes to an extreme. Towering buildings, endless crowds and maze-like train stations can make one feel like an insignificant ant. The best thing about a megacity is that it absorbs new ideas fast. Thus Tokyo has the most places in Japan that offers veg*n food. It was also incredibly easy to get made-in-Japan vegan dairy alternatives compared to other cities. So, your taste buds are in for a treat! Printed Tokyo Vege Map – get it here. You can also do the survey to get a coupon to a restaurant in Tokyo. Our google maps – We’ve mapped following listed places and more here. Based off a map done by Crokmou Blog. Muslim-friendly map – Taito & Shinjuku areas. Not all places listed may offer veg*n food. I recommend using HappyCow and the official Vege Japan map to cross check as those are likely the most updated. You can use our google maps to get directions on the go or make a copy to edit. This list is written based on train stations as trains are the main mode of transport. How far you can walk from the stations depends on the weather. During our trip there was a heat wave then typhoon, so we kept our activities near the stations. On the airport’s website there’s a section indicating which restaurant offers what veg*n-friendly dish, plus Halal info. If you need a lot of food, get from Terminal 1 before the passport control – that area has the most vegan options. I had the not very amazing sandwich from Terminal 2. Review. You can also get ready to eat foods like edamame, certain onigiris (check for fish sauce even if it looks vegan), macrobiotic cookies, hot sesame buns, soy milk (Marusan is my fav brand) and juice from airport konbinis like 7-11 or Lawsons. Starbucks offers soymilk option (drink quality is way better than Singapore’s but none of the food is vegan). I believe Soup Stock also has veg*n options. Organised mess is one phrase to describe Tokyo Station. If you’re somewhat directionally challenged like me, head to the information counters directly. There’s an interesting mikan soft serve there too, but I didn’t try as I was tired of going through the endless crowds. The most famous vegan place in Tokyo inside the gates of Tokyo Station. In Japan, there are businesses within the fare gates of big stations. There’s two outlets in central Tokyo – another in Ueno station, so you’re likely going to pass by both. I enjoyed their breakfast menu (dashi rice), tea and ice cream more than ramen, gyoza and curry. Don’t forget to grab some of the cup ramen too! Review. It felt familiar but extremely salty. The shoyu ramen was 3 times saltier than Xuan Miao. Has one vegan ramen and one vegan soft serve. Likely the cheapest hot vegan dish in Tokyo Station. This is the only ramen I had which I felt the salt level was acceptable. Review. Creamy carrot soup base – very creative! The only vegan train bento, sold at this shop between the entrances to platforms 6 and 7. Be prepared for a huge crowd and factor in more time to buy this bento. Review. Got this mainly for the experience – ekibens are part of Japan’s train culture! Famous for crazy teenage street fashion (although we didn’t see any). Also the station where you get off for Meiji Shrine. A short walk across the street from the station. Tasty, quick and affordable. Loved the bustling open kitchen atmosphere. Review. Still salty but more acceptable than T’s Tan Tan’s version. Dubbed Tokyo’s little Brooklyn, this quaint and modern neighbourhood is one of the more peaceful neighbourhoods we visited. Has a lovely bookstore and interesting indie designer shops. Didn’t eat here but passed by and spotted this signboard. Right in front of the station. The other option in this neighbourhood is Blu Jam Cafe serving Mexican food. 1000yen for lunch is quite cheap for a cafe in central Tokyo. We came here mainly to check out Sunshine City, known for its Pokemon Centre and other character shops for official Sanrio, Rilakkuma and Studio Ghibli merch. Another popular vegan spot, 5 minutes walk from the station. After eating here and the outlet in Kyoto, I think they do sweets and desserts much better than savoury foods. My favourites were the tiramisu, snowball cookies, gluten-free pancakes and deep fried soy meat (karaage). Review. We stayed in an Airbnb here. Shibuya is very well connected but it doesn’t have a lot of affordable veg*n food spots. That wasn’t an issue as we cooked 1 or 2 meals per day to stay within budget. We got groceries from Tokyu Food Show, Mega Donki and the many konbinis around. About 5 minutes walk from station. One of the outlets that have vegetarian menu. Other outlets with veg menu here. Quick, tasty and affordable. Beside this outlet is a Thai restaurant that advertised that they have vegetarian dishes. As Singapore has good vegan Thai food, I didn’t pay much notice to what they offered. Review. Curry sauce also for sale! 10 minutes walk from station. Vegan options clearly labelled. We had dinner and it was too expensive for the tiny portions, although the dishes were creative and tasty. They have different menu for lunch and dinner, with lunch being cheaper – a common practice in Japan. Breads are excellent, so grab some for breakfast. Review. Maybe good for special occasions. A large department grocery shop connected to Tokyo Station. Tricky to find (as with everything in Tokyo Station) so ask the train conductors beside ticket gates for directions. Carries Beyond Tofu vegan cheese. The bakery Andersen inside also have breads with allergens labelled. Review. Tokyo has lots of dairy alternatives made with soy! Trendy expat neighbourhood. One stop away from Roppongi station, so we dined here before heading to Roppongi. It’s not that Roppongi has no veg*n places – there’s a lot. But most spots there serve dishes that can be found in Singapore, with the exception of Afuri that does a vegan ramen. A 3-minute walk from Hiroo Station. Cute interior with a very hospitable lady boss who chatted with us (she worked in Singapore for 6 months!). My favourites were the locomocodon (Hawaiian dish with Japanese twist) and french toast. Different menu for lunch and dinner. Review. There’s no vegan french toast sold in Singapore – I was so happy! Beside this cafe is National Azabu, a chain grocery store selling imported foods. We spotted Sheese and Japan-made vegan margarine, plus many other labelled vegan packaged foods. No idea what “fermented margarine” means..
Omote-sando is an expensive, high-end neighbourhood, almost like Ginza. Lots of veg*n spots near this station. Wanted to try 8tablish which has Japanese-Italian fushion food, but they were unexpectedly closed. So we walked about 8 minutes to Cori. Falafels and hummus were quite average (had better in Singapore’s Urban Bites), but the soy karaage (Japanese deep fried meat) was amazing! Likely the most affordable dinner option in this area. The food stand beside it that had lovely vegan karaage too. The fries stall had delicious ginger apple tea. Review. This one is from the stall next door – try both! Was highly recommended by many but I felt a bit disappointed. The flavours were way too light even for me, plus it was very expensive. I’m someone who prefers to eat more affordably even if it’s less healthy while travelling. Review. At least it was good for health! 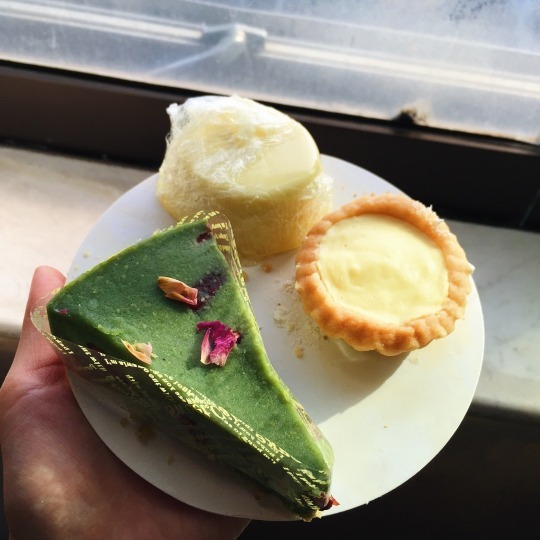 They have matcha parfait – maybe that’s worth trying. Hokkaido is best known for postcard perfect winter scenery, nature and the best local produce in Japan. In summer, it has sweeping fields of wheat, flowers and lush green forests. Even though Hokkaido is overall not as veg*n-friendly as Tokyo or Kyoto, it still offers a good amount of veg*n food spots. In fact, I had the best meals of my trip here. Here’s the list of places we ate at and more we discovered along the way. The following places are mapped here. You can also use this map to get directions, or make a copy to edit it if needed. Highly recommend renting a car, as every destination is quite far apart, especially the food places. We rented ours through HIS Singapore. They advised to avoid driving in winter or after dark. We usually ate lunch out and cooked simple dinners in our Airbnb. Many eateries aren’t open past 5pm and eating out is more expensive. Most Japan’s Airbnbs allow cooking and will come equipped with basic kitchen supplies, like fridge, stove and microwave. This article is solely based on my experiences and research, thus may not represent the whole of Hokkaido. Muslim vegans – here’s a restaurant and hotel guide for Muslim visitors to Hokkaido – vegetarian options indicated. Accuracy of information cannot be guaranteed as there may be changes to the eatery’s operations. The capital of Hokkaido and likely the most veg*n friendly! It was my favourite city out of the 7 we visited. Sapporo seems to be designed as a walkable city (in good weather) with a North American style rectangular street system. The scale of the city feels perfect – vibrant multi-use public spaces, low buildings framing an endless blue sky that meets mountains. If you’re looking for a mild temperature, quieter place to relax in with all the amenities of a city, visit Sapporo in summer. Here’s the Muslim-friendly map for Sapporo, but not all the places listed may have veg*n food. The Samurai Ramen is vegan too! Note that Iki Laboratory closes end September 2018. Short walk from the arrival terminal. Available in shio (salt) and soy sauce flavour, I requested no egg just in case. Although it was just veggies, mushrooms and noodles, it was tasty, hit the spot after a long flight, with a generous amount of wok-hei. Review. Slightly salty – but that’s normal in Japan. There’s a few non-veg places with vegan food (mainly sushi places) in the malls connected to Sapporo station. Sapporo Station is huge and quite confusing, so ask the station staff or information counter for directions. Simply show them the name or address in Japanese and they can tell you which way to go. About 10min walk from Sapporo Station, and one of the rare vegan places that are open till late for dinner. A bit hard to find as it’s in a residential area and the sign is small. Located on the second floor, take the elevator up. Review. The kelp soup was incredible! Handmade raw vegan cakes! On the pricey side but I highly recommend trying one or two pieces because they were amazing! Hands down the best raw vegan desserts I’ve tasted. They can also do whole birthday cakes. Reveiw. They were as good as they looked. A few places are concentrated around this area. There’s about 4 veg*n eateries, 1 bakery and 1 health shop near Maruyama Koen station. I’ll recommend getting an Airbnb in this area to have easy access to lunch, ready-made foods and groceries for breakfast and dinner. Alliums: Unsure – not tasted in the food, please check. Alcohol: Unsure – no tasted in the food, please check. Shop may sell alcohol. Cozy, amazing food, friendly English-speaking staff with English menu. 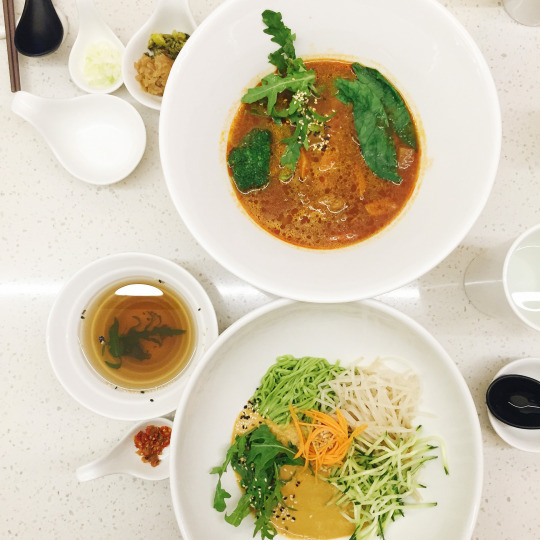 Serves delicious and healthy Japanese-style meals with some gluten-free bakes at the counter. Reveiw. We waited quite a bit for this – but it was totally worth the wait. 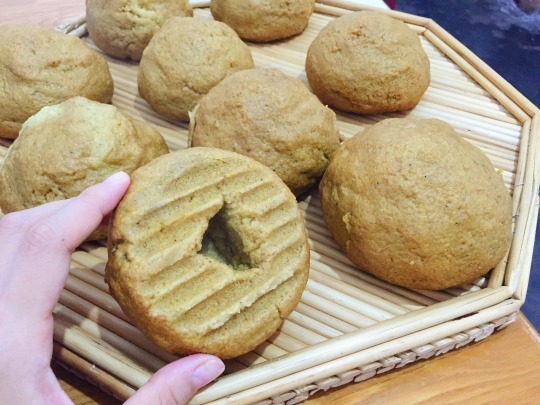 Sapporo’s only pure vegan bakery with incredible breads made from natural yeast. There’s no seats inside so we stood outside to eat (eating while walking is considered rude in Japan). Reveiw. Try their black sugar muffins! A health shop with lots of vegan groceries like soy mayo, vegan brown rice instant noodles, organic fruits and veggies. Not everything here is vegetarian. Right beside Huluta Pan. Also bought the yummiest silken tofu from this fridge. Asahikawa may be Hokkaido’s second largest city, but its not known to be a tourist centre. We ended up staying here because our Airbnb country house in Biei got cancelled due to Japan’s new home sharing laws. The nearest available one was here. It turned out to be a great thing as there were plenty of good food in this city! Here’s the Muslim-friendly map for Asahikawa, but not all the places listed may have veg*n food. Incredibly friendly folks serving up healthy fusion food in a peaceful and cozy cafe. The guy, Koji, speaks fantastic English and made us feel at home! Note that it’s located at the corner of outside a building so keep your eyes peeled. We had a great value lunch set complete with smoothie, soup, rice, 4 side dishes, cookies and dandelion coffee. Reveiw. The croquette was our favourite! Allergens clearly listed. The lady at the counter understood basic English and could recommend which drink had no dairy. Breads were crisp outside and soft inside – heavenly. Reveiw. The Americano was bad though. Seems like they usually depend heavily on milk and sugar to flavour coffee. Homely restaurant in the owner’s house. Specialises in traditional handmade soba. Hands down the best meal I had in the whole of my Japan trip! The lime soba had only 3 ingredients but the flavours were so uplifting and memorable. Review. Only available during summer. No it’s not too sour – Japanese lime is different from our lime. This is not a physical cafe, but the lady lives within Asahikawa and can do vegan bentos. You can order by messaging her over Facebook. I recommend it if you’re going to somewhere without foods you can eat. Furano is famous for seasonal flowers. In summer, lavender is in bloom, which attracts hordes of domestic and Asian tourists. We attempted to go there after visiting Farm Tomita as it was the nearest (about 10 mins drive). We reached at 1.30pm and was surprised to see it’s closed, even though their Facebook indicated open. The lady there was very apologetic that lunch was sold out. A local vegan later told me that their opening hours are quite irregular despite serving good food. Still an option in this area, but recommend to PM them over Facebook before visiting. Didn’t go here but it’s highly recommended by a nice local vegan lady we met. Has at least one vegan ramen. Also within Furano, walking distance from Navo. Slightly outside Furano. After visiting Navo only to find it’s closed, we drove 20mins here – and had the best curry and corn dishes! A homely cafe in a wooden house, run by a couple. Has an English menu and the friendly guy who cooks can speak basic English. Review. I had the simple set – was quite filling, fresh and great value for money! The only major hiccup in our travel plan happened here. Contrary to my expectations, this popular ski resort is not vegan-friendly, despite hosting many foreign visitors (which is why I advise to carry backup energy bars when travelling). But if you are lacto-ovo-veg, Afuri can make a vegetarian ramen (noodles have egg). Party Deli Green Package had some Italian-style side dishes that seemed vegan but they were served cold. Altezza Tomamu is an Italian restaurant so they might have vegan dishes, but it’s expensive. We came here mainly to see Tadao Ando’s Chapel on the Water, but it was closed for a wedding – only then we found out that it’s open during dark hours, which are not good times to drive. We had a light lunch of Hokkaido potatoes and melon from some small stalls on the resort grounds. Although not the most substantial, we enjoyed it as it was the first time we had fresh local produce. Hokkaido melon is as sweet as legend says! Japan is not as friendly to vegans and vegetarians, compared to other developed countries. Despite that, we never went hungry! I’m sharing my experience as a vegan visiting Japan + what I’ve learnt in my 28 days trip, and the places where we had incredible food! We visited Sapporo, Asahikawa, Tokyo, Yokohama, Kamakura, Kyoto and Osaka. These articles are solely based on my own experiences and research, thus may not represent the whole of Japan. Japan is full of Buddhist temples, but don’t expect to find Buddhist vegetarian food as easily as in Singapore. In large cities, there’s better understanding due to a more international population, but you still can’t expect every place to have veg*n dishes. A quick browse in all the vegan/vegetarian Japan facebook groups shows that most of the members are expats or tourists. Veg*nism seem to be a new concept to most local Japanese. The word for “vegan” is ビーガン or ヴィーガン. But, not everyone knows what it means. There’s also no vegetarian or vegan labelling for packaged foods, and most of the ingredients are in Japanese. Slightly easier if you can read Chinese. But if you can’t, join the Is It Vegan Japan, Vegan Supermarket Finds in Japan and Vegan Japan Facebook groups to familiarise yourself with how the vegan foods look like. The Chinese word commonly used for vegetarian does not carry the same meaning in Japan! This is shellfish stock. Since Japan traditionally depended greatly on the sea for sustenance, fish as a basic seasoning is already ingrained in society, mainly in the form of katsuobushi. Fish is in certain soy sauces, miso pastes, soup stock and other seasonings. Sometimes dried fish flakes (bonito) are used on a topping even in vegetable dishes. Fish parts are also used to make dashi, a traditional soup stock used in many dishes. It’s so common and invisible that even servers who may know what veg*n means may still forget about the little bit of fish in sauces. Which is why being specific helps more instead of saying “vegetarian”. Miso soup can often contain fish sauce or stock, so it was one dish that I ate only at veg*n places. The level of English varies between age groups – generally younger Japanese people seem to have better English. 90% of Japanese people I met understood basic to moderate English; the other 10% of the time I used gestures, Google Translate or pictures (I highly recommend getting a good connection on your phone). So that wasn’t a major issue through my trip. The main issue is that most people don’t understand “vegan” and many still think fish sauce is okay for veg*ns. Japan loves veggies (yasai). Even the convenience stores stock fresh produce. Cafes proudly advertise that they use a large variety of veggies. Just because something looks like only veggies and tofu doesn’t mean it’s automatically vegan. It’s likely to be cooked in meat or fish stock, with small bits of meat. Common dishes like “vegetable curry” or “vegetable soup” from a non-veg place, very likely have pork or fish in the soup base. “Summer Veggie Bento” that has chicken, egg and milk listed in the allergens. Japanese use a lot of alliums in cooking to give the umami and pungency. The good thing is that awareness of allium-free diets seems quite common in the veg*n places. “Oriental vegetarian/vegan” is the term used locally to describe this requirement. I realised it’s quite common for servers at veg*n places to double check if you can take alliums, or have labelling of such information in the menu. Many places also can do allium-free meals if given advance notice. 90% of eateries serve alcohol like beer or sake. Japanese use a lot of alcohol ingredients like sake, mirin, sake lees and amazake in food. Also, fermented foods like miso have small amounts of alcohol which is a result of the natural fermentation process. So what you can eat depends on how strict you need to be. I’ve also seen alcohol used in packaged foods too. The kanji 酒 surely means alcohol is present. For my list, I will try my best to indicate if alcohol is present. Note for vegan Muslim friends: I’ve not seen halal certifications displayed in Japan. Thus if you visit a non-veg place, there’s high chance of cross contamination with pork, since such ingredients are very commonly used in foods there. Halal Media has a guide for Muslims visiting Japan, but note that most of the eateries listed may not have veg*n food. getting easier to be veg*n in Japan! The Olympics will bring even more veg*n tourists to Japan. NGOs like Tokyo Smile Veggies and Japan Vege Project are campaigning for more local restaurants to offer veg*n dishes. The Tokyo government is actively pushing for locals to learn English. Pretty sure if you visit closer to 2020, there’ll be more options available with less communication barriers. Vege Project is now actively helping veg*ns live easier in Japan. Japan takes food allergies seriously and is very transparent in regards to allergen information. Allergens are clearly labelled in almost all food places and on food products. The allergens that are required to be declared include egg, dairy, certain seafood and meats. Thanks to this, it’s pretty easy to spot the veg*n option. Note that some Japanese may not know the English word for allergens, so use “arerugi アレルギー” if needed. This helped me once while searching for vegan breads on a supermarket shelf. The store assistant only understood “arerugi information” and even helped read out the ingredients! Very common to see food allergens listed, like this vegan bento from Tokyo Station. In most areas where tourists or expats visit, you’ll have the least problems finding veg*n food. People there are more used to communicating in English and might have served a few veg*ns before you. But if you go outside of these areas, you have to be more prepared by packing something in advance. Note that some areas that serve mainly domestic or China tourists have very little or no veg*n food due to lack of demand. Eg: Tomamu Ski Resort in Hokkaido. Food in Japan is SO GOOD. Japan’s food is the best quality food I have ever had so far. Although it’s more expensive than Singapore’s, I seldom felt disappointed as the taste, freshness, service and creativity are MUCH better! This alone is worth looking forward to and doing more research on. One of the best Japanese style meals we had from Aoi Sora Cafe. Note that Happy Cow has its limitations. They prefer to list vegan or vegetarian places to support them – which is a great initiative. But, it excludes many non-veg places that may offer veg*n dishes, and in certain situations (eg, your non-veg family want to eat seafood) that’s not the most practical. 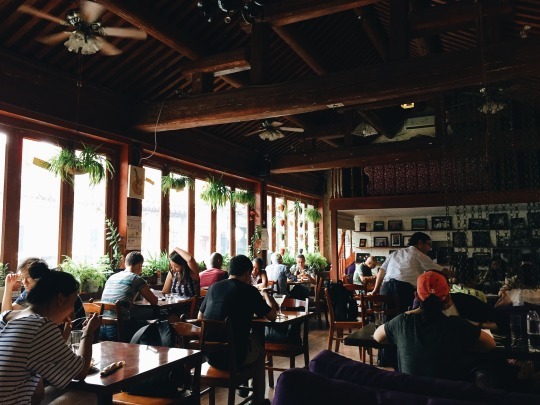 Sometimes the information (eg hours, address) listed may not be updated, as restaurants tend to prefer to update their own website or social media first, so follow the restaurant’s Facebook page for updates. Join the Facebook groups for more information and get the latest news on which products are vegan, events, new places opening, new menus, places closing etc. Also great way to know which packaged foods are vegan so you can buy them without worries! I think this map is constantly updated by Japan Vege Project, and is currently not fully complete. There’s places I visited in Hokkaido that aren’t listed. Thus I will share my own google maps but I recommend that you check back to this map in future. They also provide printed maps for Tokyo and Kyoto. This is a new platform that helps you find vegan and vegetarian dishes from anywhere in the world. The last time I checked, there’s plenty of reviews from Tokyo. Download it for free from the app or play store. I highly recommend posting your dish and product reviews. Not only each post contributes $1 to an animal welfare group, you’re also helping others to find food easily and you can give private feedback to businesses through the app too. Here are my reviews from Japan. One main reason for my visit was to enjoy foods that I can’t get in Singapore! So I planned all our accommodations and schedule around veg*n places that are highly recommended by locals and expats. I had half a year to plan, so I found plenty of places to explore. In fact I only visited 60% of my to-eat list in the end. If you don’t have control over your schedule and place to stay, don’t worry too much. 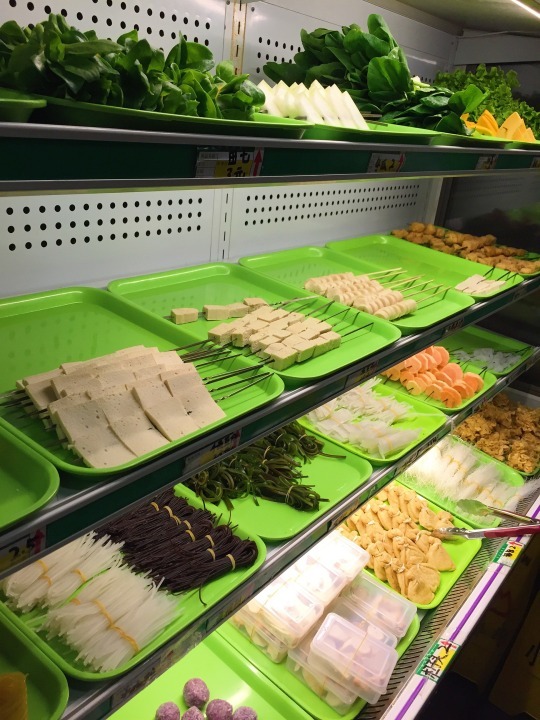 Most convenience shops (konbinis) in cities have good and cheap options, such as rice balls, sushi, salads, snacks and ready-to-eat tofu. As usual, be careful of hidden animal ingredients in seemingly vegan foods. Konbinis are everywhere (sometimes 4 together in a spot) and literally do everything for you, including heating the meal for free. Here’s the most complete list of vegan finds at konbinis. Here’s a video of vegan food in 7-11. Eating out is generally pricier in Japan compared to most Asian countries, and pure veg*n places are usually more expensive. Veg*n cuisine is seen as healthy and organic food with Western influences. This is the main reason I booked Airbnbs so that we could cook. An average meal for one in Tokyo can be $10-$20, while $20 groceries can make about 2-3 meals for one person. We could also do laundry without additional costs. If you really don’t wish to cook (although I’d recommend it if you’re on a budget), you can depend more on konbini foods, or dine at the chain eateries which offer veg*n dishes. Here’s some handy language card. If you have to go to a non-veg place and may face communication issues, flash this. Most locals, at first sight, seem to automatically assume that those with East Asian features are Japanese. Sometimes, even if I spoke English to them in the first place, they still thought I’m Japanese – so they replied in fast Japanese or gave Japanese printed materials. This caused some miscommunications and awkward moments. If you’re not confident speaking their language, I suggest you speak English first and ask for English menu from the start. You can use Japanese words to assist if needed. This is so that they know that you aren’t local and adjust the service to help you better. Many veg*n restaurants are small businesses run by individuals or one family. Their opening hours may be irregular as they have less manpower compared to large chains. For example, in Hokkaido, most places only do lunch and require a reservation if you want dinner. In Tokyo, some places are only open for weekday lunch. Some can be closed for few days during public holidays. Before visiting, best to contact, or at least check their social media pages for latest updates. I used Facebook messaging to check directly if they were open. All of them could reply in English, and were very friendly and welcoming! A message I sent to confirm opening time. Although it seems like quite a bit of work to prepare for a holiday, these are guaranteed to make your visit in Japan incredible. You’ll be rewarded with a richer experience and your taste buds will be delighted at what Japan has to offer! The land of Confucius, Shandong peanuts and mantous. 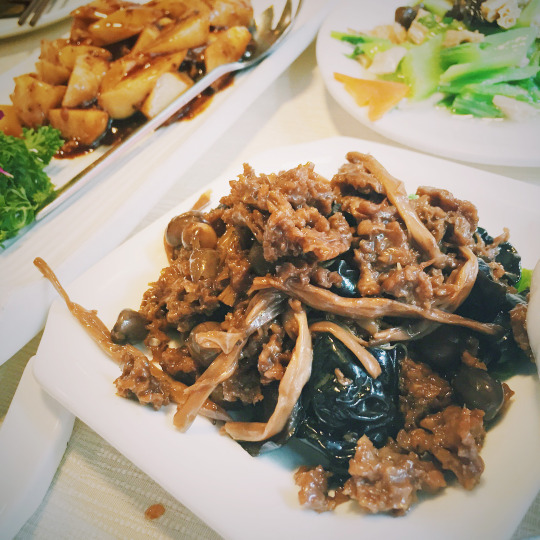 Being a province in north China, the food can be different from what you’d associate with ‘Chinese food’, which is mostly from southern China due to the bulk of emigration from there. Wheat, in the form of bread, buns and pancake items are the staple compared to rice in the south. 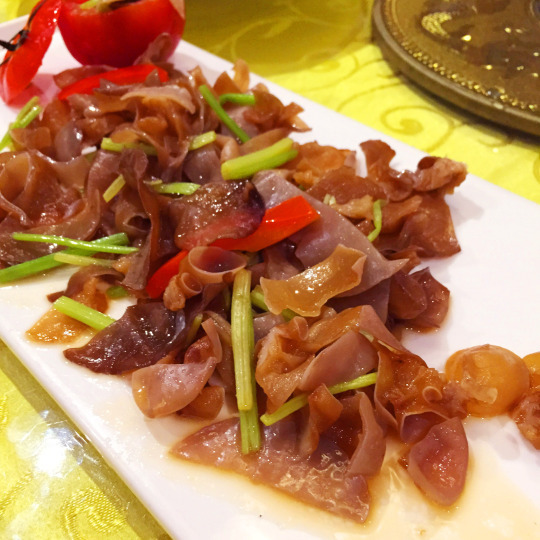 Weifang is a small city in Shandong hence no Happy Cow entry – but the traditional food I had at locals’ homes are worth sharing. Handmade by a distant aunt – wheat pancake jiazi stuffed with chives and mushrooms, cooked without oil on a metal pan. Just one is very dense and filling because it’s farmers’ food. Bread items are always eaten with millet, corn or rice porridge because they can be too dry on its own. Wo wo tou – steamed corn bread with a pinch of baking soda to bring out the sweetish fragrance of cornmeal and soy flour! Gluten – free. It’s meant to be conical shaped with bigger hole but my uncle was lazy! The hole can be stuffed with stir fries for a savoury bun. Other types of steamed buns are mantous (plain wheat bun) and huajuan (spring onion and wheat twisted into a bun). 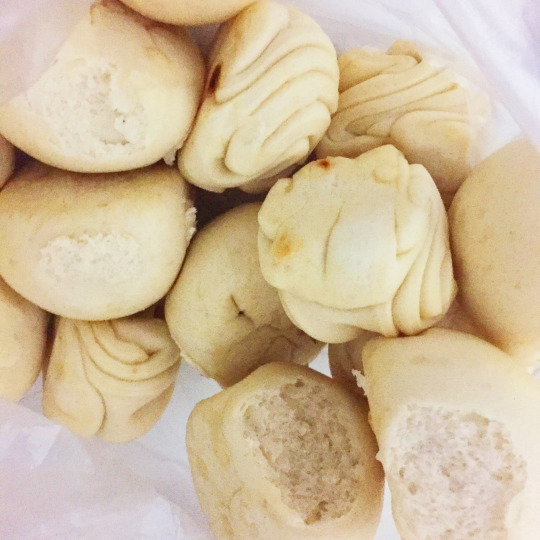 What I love most about Chinese steamed breads are the simple base ingredients – yeast, wheat flour and water. Easily vegan and goes well with any dish! 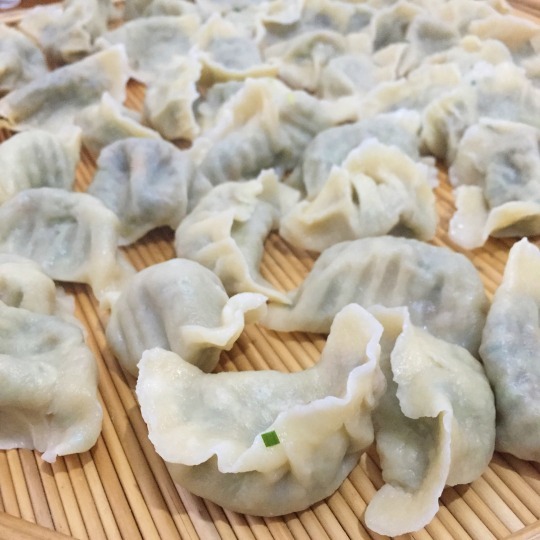 Of course, the iconic northern food, dumplings! Making them is a family event. This is stuffed homegrown chives and gourd with tofu! Large bamboo trays are used to hold wheat – based foods because they are naturally anti-stick. 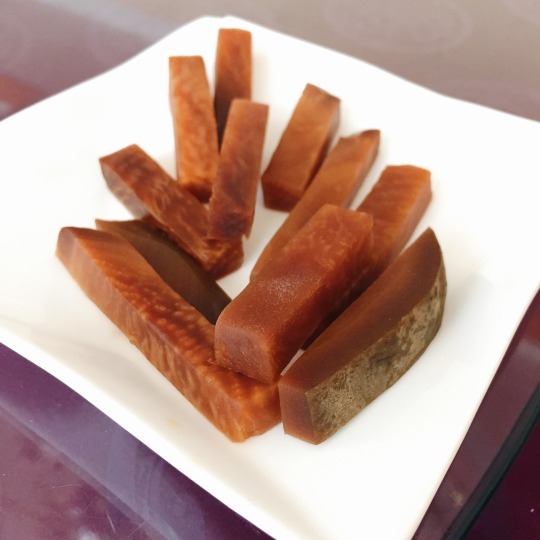 Pickled foods are in every meal in Shandong. It can be any crisp or juicy plant from cucumber to peanuts, and fermented in water or wine. 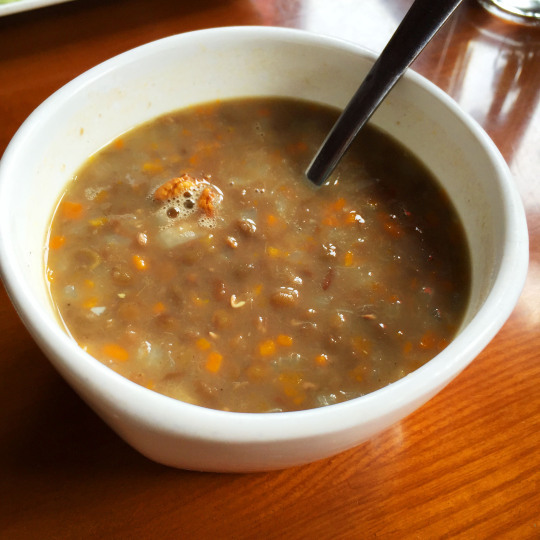 It’s VERY SALTY but also very umami – best nibbled with porridge! 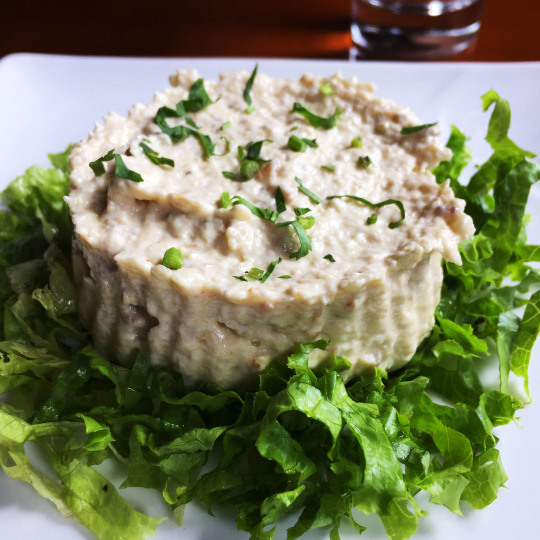 Raw, minced garlic is a popular dressing for cold dishes. There’s even a saying that Shandong people can sing well because raw garlic make voices good. 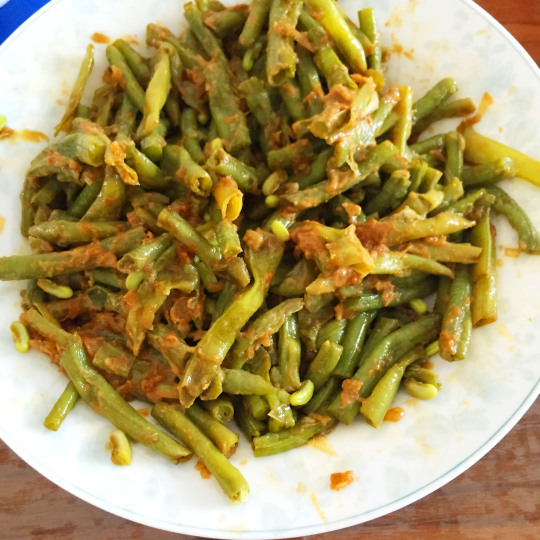 This appetizing steamed french beans with garlic, sesame sauce and vinegar made by my cousin in law is creamy, tangy with the famous Shandong – grown spicy, garlicky kick. 菇汤素食馆 (literally ‘Mushroom Soup Restaurant’. 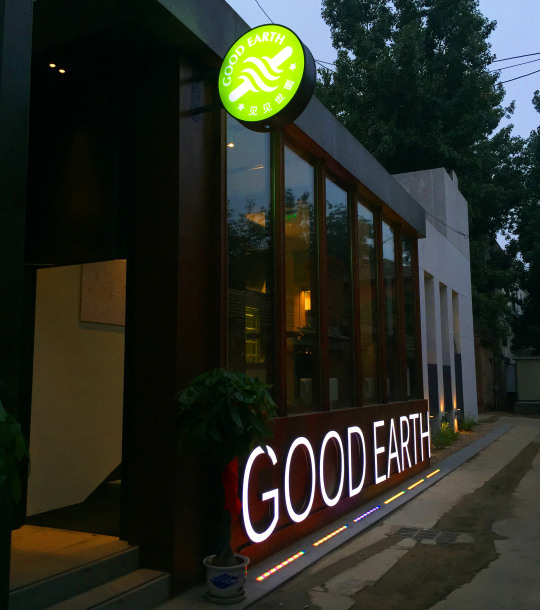 Address 高新区东方路与福寿街交叉口东南) is one of the vegetarian restaurants I visited in Weifang – the best one! Choose anything you want (The pictures show only half of the buffet) and it will be boiled in rich mushroom broth. Such an overwhelming selection of noodles, ingredients and sauces – from seitan sticks to sweet yam balls to arrowroot noodles. 99% vegan except for the (very little) mock meats! Lastly, 2 traditional, handmade snacks from a second-generation shop where the son learnt the art of making from his father and is continuing the tradition, but isn’t optimistic about passing onto his son. 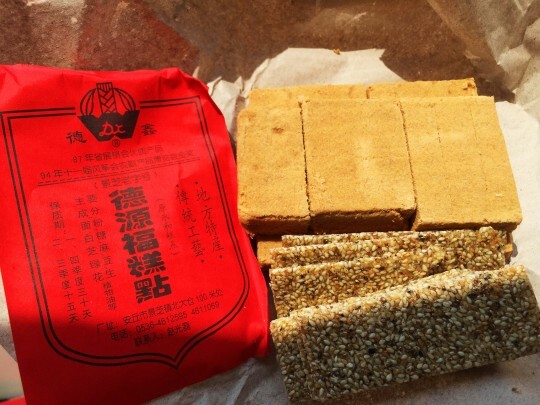 Melt-in-your-mouth, rustic green bean cake and the crispiest, most fragrant sesame candy I’ve had. Definitely supporting them the next time. 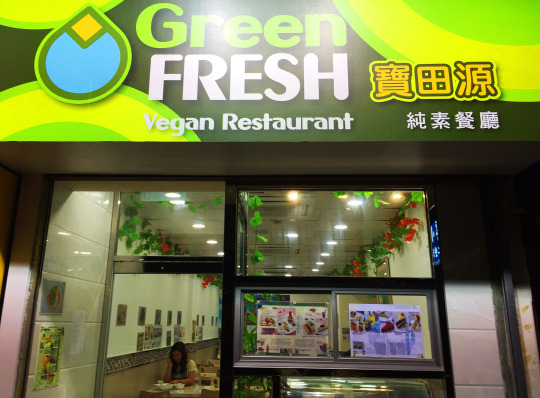 Here ends my Vegan in China series. My travel itch is still there – look forward to more discoveries! Meanwhile, recipes. Thanks for reading these long posts and hope they help in your travels! The capital of China, other than the air pollution, it is wonderful in many ways. Strolling through hutongs you can tell the local residents really love their pets. Perfectly groomed and well-fed, even being carried in their human parents’ arms like babies. 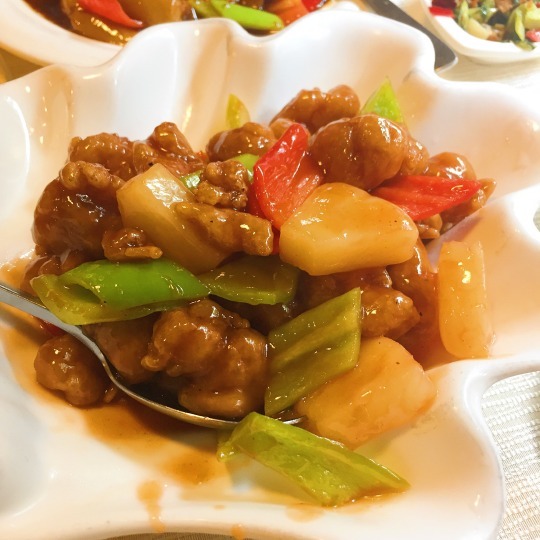 In one of the hutongs near Yonghe Lama Temple, there’s a vegan gem – The Veggie Table, serving an extensive menu of mostly Western food with the best environment I’ve entered in Beijing. Maybe its the air purifier, or the occasional cats running in and out, a wonderful selection of books and potted plants lining the window sills. And gosh, they are amazingly popular and almost always fully seated, sometimes by cats. Once there was a cat napping on a sofa seat and refused to move despite coaxing from many people, so the customer just got another chair! Everything I ate here were excellent – even better quality than what I had from similarly priced restaurants in Singapore. Wholesome, clean, and made from scratch hence a bit of a wait but definitely worth it. Plus I really appreciate the accurate English translation in their menu! 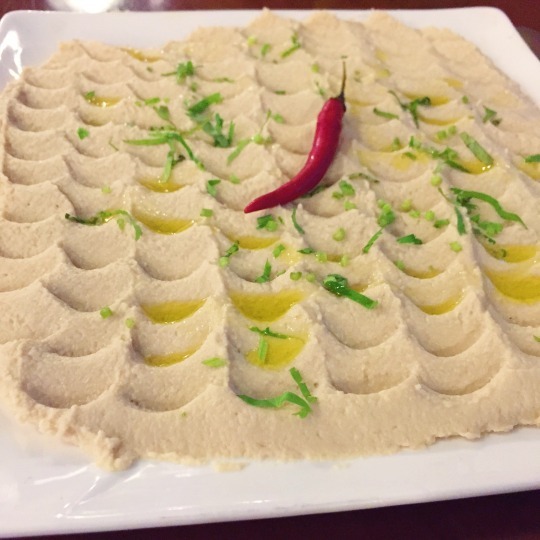 Safe to say these are the best hummus and baba ganoush I’ve ever had! They have only a few soups – pumpkin, chilli, lentil, tried them all and can’t find a single fault! My favorite will be their fluffy cous cous with a heaping of veggies in tomato sauce with crunchy almond bits. Being someone from a tropical country, I wasn’t quite used to the too generous portions! I truly wish there’ll be more restaurants who really care like this in China! ‘Stumbled’ upon a new vegetarian noodle place, Good Earth, after my friend did a check for veg places near the popular Sanlitun shopping area. It’s opened by a famous food blogger and the reviews were great so we were excited to try! Some dishes have egg, otherwise menu is super vegan-friendly, everything exquisitely handmade. Choose your noodle type and then the sauce or soup. In a country with food safety issues, transparency is really valued. 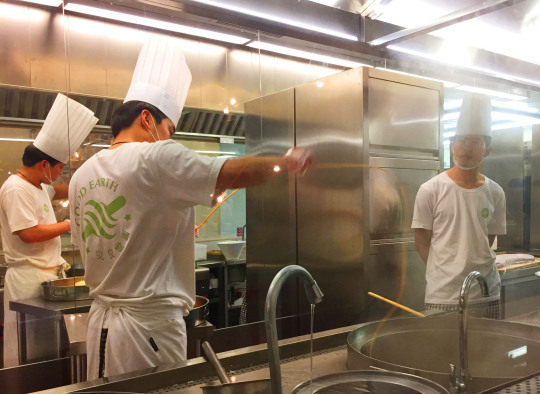 You can look through glass panels into a clean kitchen and watch chefs making your noodles. This guy here is pulling a single strand of TEN METRES long noodle from dough! Yes, a single strand of 10 metres long! My friend loved it. And look how big the bowls are – specially designed so that soup and sauces won’t spill out when you slurp! I got a warm noodle salad with sesame sauce and my friend an eggplant and tomato soup base noodle. The nice waitress told us that the soups are stewed over many hours, so flavourful that my omni friend was suprised that it’s made purely with veggies! With everything handmade and made in-house, is there’s any need to say that taste is superb and wholesome? Plus the place had clean vibes and lovely interior that made dining very pleasant. A bit hard to find being nestled in a hutong, but a MUST try in Beijing. Fuzhou, capital of Fujian – a province of immigrants who brought their culture all over the world. 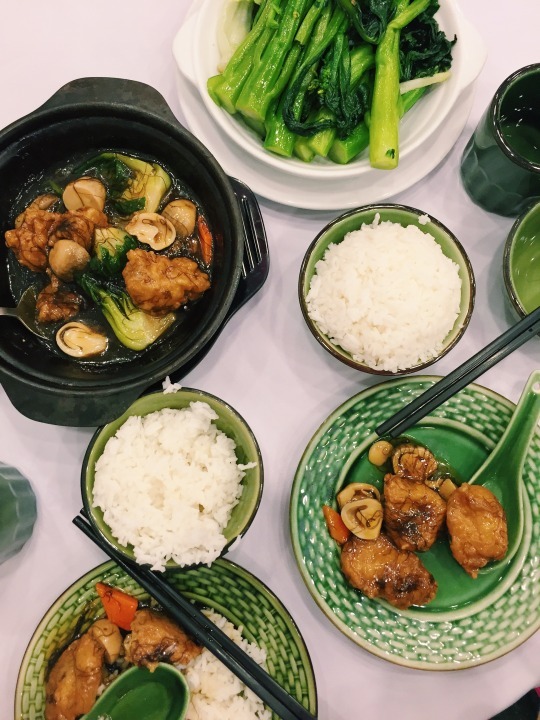 Coming from a country with many Fujian descendants, yet Cantonese cuisine being more dominant, the new dishes were an eyeopening and biggest treat to the taste buds! These are favorites picked from 2 of the best restaurants I went to. 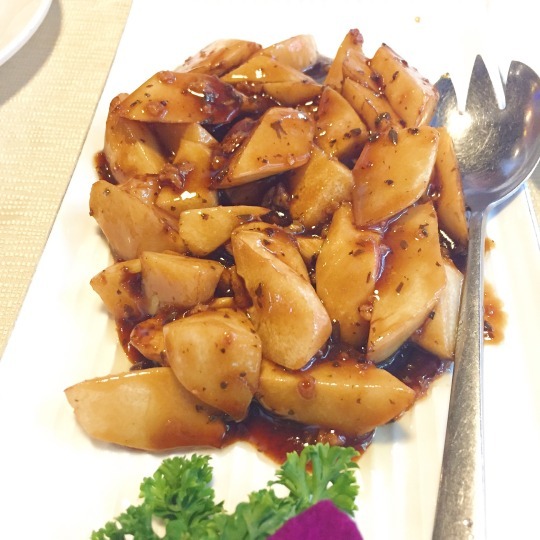 First, from Ji Shan Zhai Restaurant – a Fuzhou specialty is lychee pork. This meat-free version is made from monkeyhead mushrooms, an unique mushroom used in Chinese food for its juiciness and similarity to fatty meat – smooth, tender and melt-in-your-mouth sweet and sour pieces! 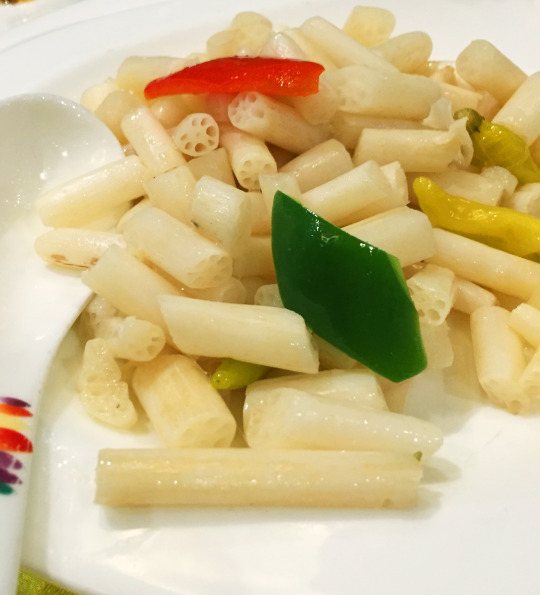 Fuzhou is also know for bamboo shoots! Crunchy with a subtle sweetness – this one is done with savoury Chinese olive sauce. 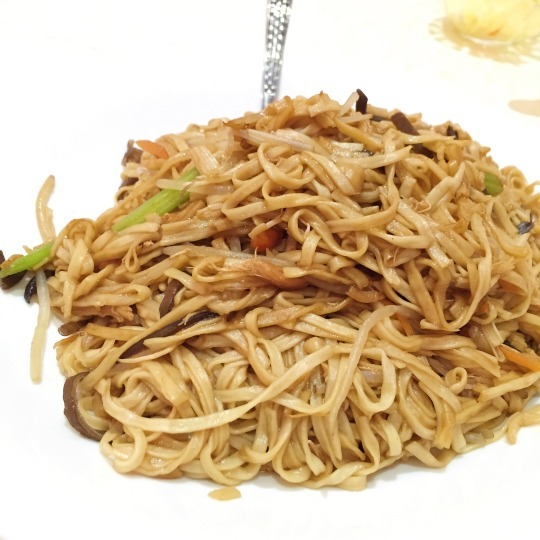 This is what the vegan world loves – seitan, or mian jin (wheat gluten), has been used since thousand of years ago as protein for vegetarian monks. One main characteristic of this spongy protein is that it can absorb flavours fully, and magnify them. Most excellent meal was from Lotus Teahouse – a posh kind of place that I won’t usually go. But fine dining has its merits, every dish was full of surprising combinations with some ingredients I’ve never heard of. 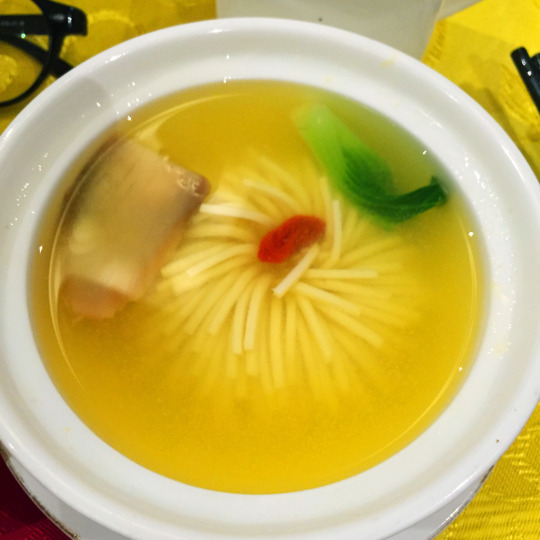 Soup must be in every meal in the south – I thought this was a chrysanthemum flower but it turned out to be soft tofu skillfully cut into this flower shape, sitting in a superb truffle broth. I never knew things like these existed – a cold dish of a type of fungi that grows on bamboo! The crispness and crunch was indeed reminiscent of fresh bamboo shoots, addictive and refreshing! Lotus roots are common but baby lotus roots is a first time – this was made into crunchy pickles. Those cute little holes soaks up the sweet vinegar perfectly! 2 days in Hong Kong is too short to try the 200 over veg food places! Had no problem finding nice places within walking distance wherever we were. Just don’t expect good service from most places – its all about the money! 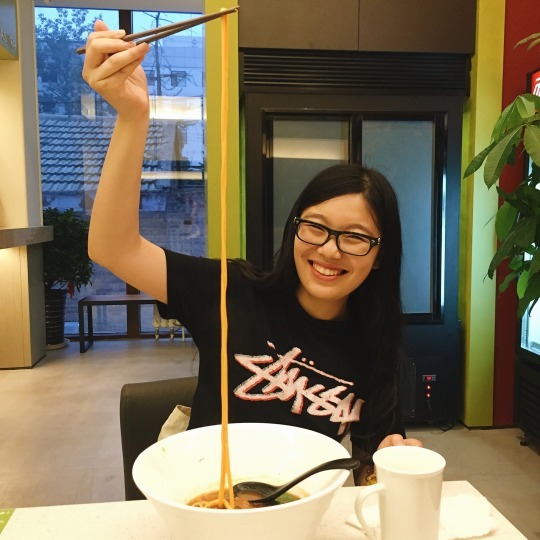 From one of the canteens in Chinese University of Hong Kong, probably one of the least vegan friendly spots but they had my favourite type of noodle soup! And Green Fresh just happened to be right near our hotel. The staff there are superbly friendly for HK standards, welcoming me like family when I came back a second time (and literally swiped their desserts). Generally their mains are on the very healthy side, less oil, salt, seasoning etc. A bit light for salt loving person like me, but you can feel each dish is refined and detailed. 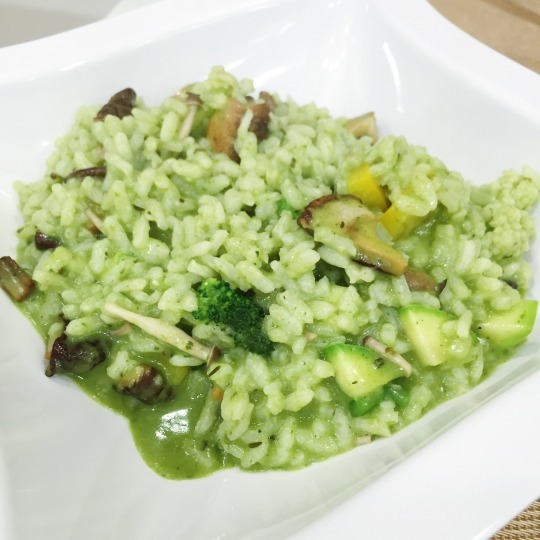 This refreshing pesto rice was my fav! The absolute BEST is their sweets. Cakes, puddings, mango tarts, muffins..they have something new every couple of days! 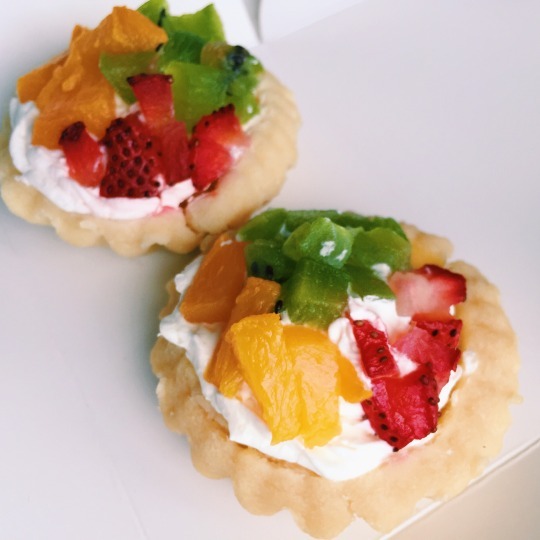 The raw ones are so-so, but the tarts..are the BEST vegan fruit tarts I had! The crust perfectly crumbles and melts in your mouth with generous amount of whipped cream. Po Lin Vegetarian is a small restaurant selling traditional Cantonese dishes with good portions and prices. Taste wise is average to me since we also have plenty of Cantonese food in Singapore. These were some excellent sweets and cakes. 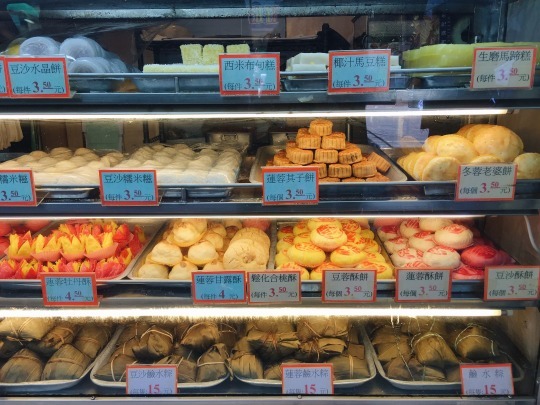 I got the coconut jelly cake, glutinous rice balls of peanut, red bean and sesame fillings, savoury seaweed sticky rice roll and lotus paste wife cake. Compared to those sold in supermarkets back in Singapore, everything tasted much fresher, sweetness not overdone and very, very flavourful!